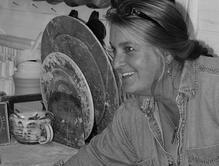 Peasley Pottery is owned by self-taught artist/potter, Nancy A. Peasley. Her studio is located on a small farm in a rural town in Downeast Maine surrounded by woodland, wildlife and her two horses, Beylah and Annikens. Nancy began as a painter, later expanding into woodcarving, pottery and sculptures. Prior to pursuing her artwork full-time, she held positions as a marine mammal research assistant & stranding coordinator, commercial fisherwoman, and in law enforcement. Much of the inspiration for her work comes from growing up in a rural area where she spent a great deal of time going hunting, fishing and trapping with her father. In 2014, she was honored to receive a large commission for a benefit fundraiser that was organized by The Environmental Resources Network (T.E.R.N.) for the continued research and conservation efforts of the North Atlantic Right Whale by the State of Georgia, Department of Natural Resources Non-game Division. She handcrafted of over 80 pottery pieces depicting known, individually identifiable North Atlantic Right Whales which frequent the coast of Georgia.